Phew... the MB family is frying in FNQ, 37C in Cairns yesterday (heat index of 41C). Lots of extreme weather events all over our vast continent, with a very unseasonal cold snap in southern Australia, it actually snowed in the Blue Mountains and at Thredbo yesterday. It's also quite dry in FNQ, but there are flooding rains falling in the south-east of Queensland, it's normally the other way around at this time of year! 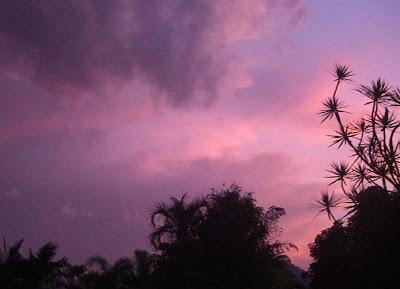 MB snapped last night's sunset in Cairns, the colour of the sky at dusk was a sight to behold. Wow! Amazing colour pic of tropical sunset. It isn't officially summer yet. We rainmakers are active down in the Tweed.